Experienced showmen such as Ed Sullivan weren't sure the world was ready for such wild moves as the slick Elvis Presley was offering, but when Elvis proved too popular not to book, Sullivan scheduled him. Elvis made his first appearance on The Ed Sullivan Show on September 9, 1956. Elvis Presley had already appeared on other national television shows (such as on Stage Show, The Milton Berle Show, and on the popular The Steve Allen Show) when Ed Sullivan booked Elvis for three shows. Elvis' pelvic gyrations during his appearances on these other shows had caused much discussion and concern about the suitability of airing such provocative and sensual movements on television. Although at first Ed Sullivan said he would never want Elvis on his show, Sullivan changed his mind when The Steve Allen Show with Elvis as a guest had about twice as many viewers as Sullivan's show that night (they were competing for the same audience since they were in the same time slot). After negotiating with Elvis' manager, Ed Sullivan paid Elvis the huge sum of $50,000 for appearing on three of his shows: September 9, 1956, October 28, 1956, and then on January 6, 1957. For Elvis' first appearance on The Ed Sullivan Show on Sunday night at 8 p.m. on September 9, 1956, Ed Sullivan himself was not able to host since he had recently been in a very serious car accident that left him in the hospital. In his place, Oscar-winning actor Charles Laughton hosted the show. Elvis was also not on location in New York for the show since he was in Los Angeles for the filming of Love Me Tender. Laughton hosted from New York and then when it came time for Elvis' appearance, Laughton introduced him and then cut to the stage in Hollywood with Elvis. Elvis appeared on a stage with large, artistic guitars as decoration. Wearing a plaid jacket and holding his guitar, Elvis thanked Mr. Laughton and the audience and then said, "This is probably the greatest honor that I've ever had in my life. There's not much I can say except that hope it makes you feel good and we want to thank you from the bottom of our heart." Elvis then sang, "Don't Be Cruel" with his four back-up singers (the Jordanaires) followed by "Love Me Tender," which was the not-yet-released title track from his new movie. During this second set, Elvis sang "Ready Teddy" and then ended with a portion of "Hound Dog." Throughout Elvis' entire performance, viewers could hear girls in the audience screaming, especially when Elvis did his special twitch or swung his hips or swiveled his legs. Elvis appeared to enjoy himself, frequently smiling or even laughing, which made him seem friendly, sweet, and hunky — depending on who was watching. During Elvis' first performance on The Ed Sullivan Show, the cameras stayed mostly from the waist up during the first half of Elvis' appearance, but during the second time he appeared that night, the camera widened out and the TV audience was able to see Elvis' gyrations. 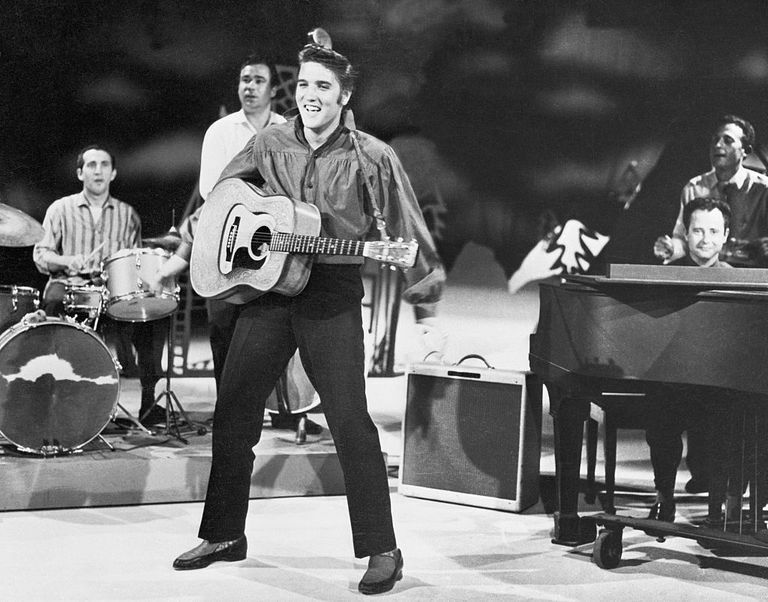 While many have felt that Elvis was censored by only showing him from the waist up on The Ed Sullivan Show, that really only happened during Elvis' third appearance, on January 6, 1957. For some still unknown reason (although there are a lot of rumors as to why), Sullivan allowed Elvis to only be shown from the waist up during that third and final show. Elvis' appearance on The Ed Sullivan Show was a major success. Over 60 million people, both young and old, watched the show and many people believe it helped bridge the generation gap for Elvis' acceptance into the mainstream.